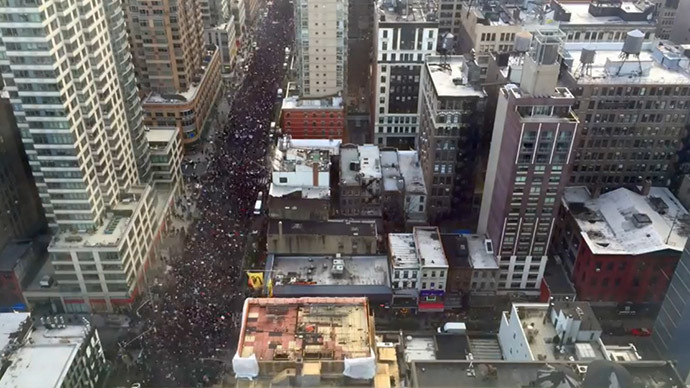 A time-lapse video depicting Saturday’s Millions March in New York City shows just how many people took to the streets to protest against police brutality in America and demand justice for unarmed black men killed by law enforcement. Tens of thousands of Americans across the country joined in massive marches against the killings of Michael Brown, Eric Garner, and Tamir Rice, as well as the non-indictment of police officers in two of the cases. The time-lapse video, uploaded by YouTube user Vinay Pulim on Sunday, shows the view from New York's Sixth Ave and 29th Street, with people marching past the site for around 1.5 hours. The sped-up footage lasts less than 30 seconds, and manages to show the incredible number of people who joined the mass rally. Various hashtags were used by protest organizers on social media, including #BlackLivesMatter, #JusticeForAll, and #ICantBreathe – the statement that Eric Garner said 11 times before being killed in a police chokehold. Some 50,000 people attended the 'Millions March – Nat'l Day of Anger' in New York, according to the event's Facebook page. The crowd of protesters stretched for more than a mile up Fifth Avenue, rally organizers said. Traffic on the Brooklyn Bridge – which connects the boroughs of Manhattan and Brooklyn over the East River – was shut down after over 1,000 protesters descended on the iconic suspension overpass. The Saturday march was the largest demonstration in New York City since a grand jury decided not to indict an NYPD officer in the death of Staten Island resident Eric Garner.